Reaching the right audience on social media is no longer about skill. Today the game is pay-to-play. With platforms saturated, organic reach for businesses has taken a nosedive. That doesn’t mean businesses should give up on the 2.6 billion people active on social media worldwide. You can give consumers the opportunity to engage with your brand on their terms using social media advertising. Advertising options vary by platform. 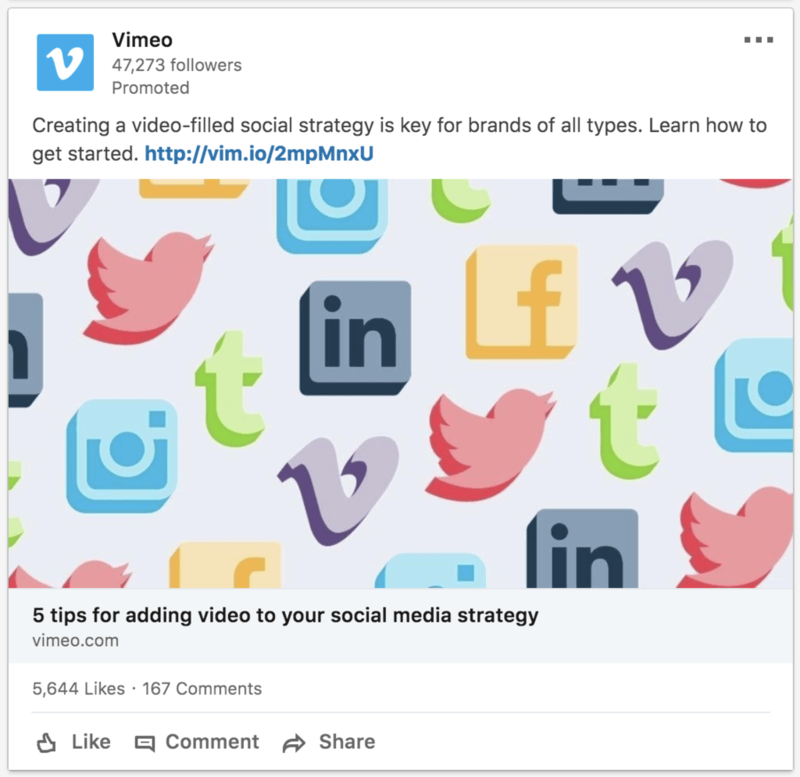 Before you start a campaign, learn about ad options, costs, and effectiveness for the five biggest players in social media. 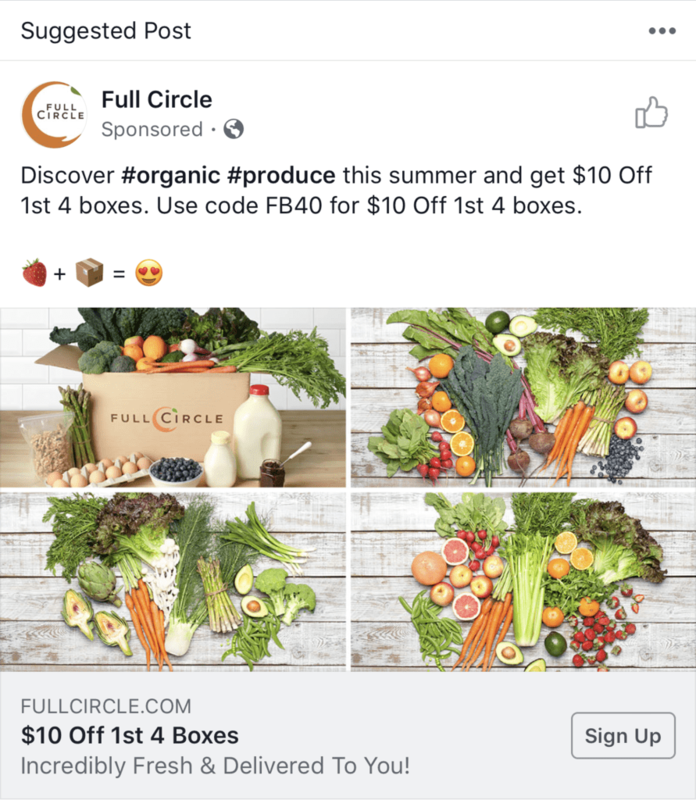 Since Facebook changed its algorithm to prioritize interactions between family and friends, businesses are turning to ads more than ever. Facebook has a monthly reach of two billion users and collects extensive data on demographics, interests, and behaviors. It’s an excellent platform to begin a social media advertising campaign. 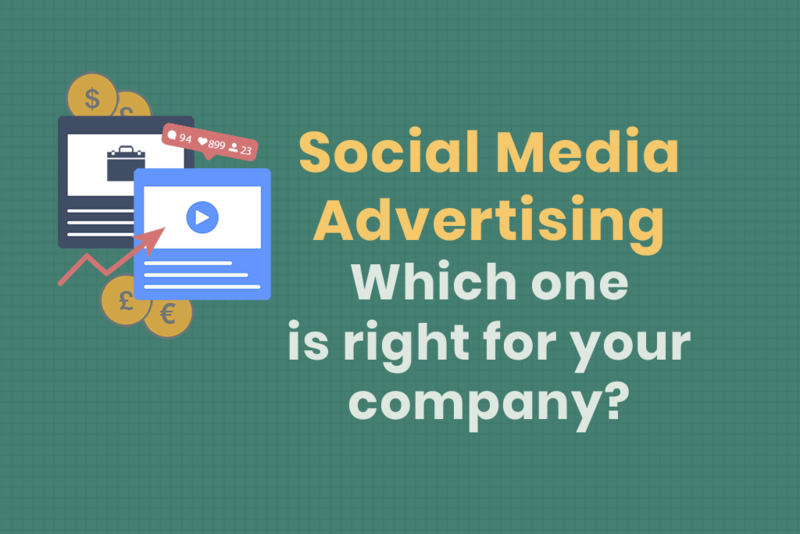 It’s no surprise that the social media giant offers extensive ad options. Photo and video ads appear in users’ feeds and are the most well-known. Within these ads, you can choose to add variety with Collection, Carousel, or Slideshow formats. Collection posts function like a shopping catalog. They showcase a set of products in one advertisement. Carousel posts contain up to 10 images or video clips. Get creative with an interactive series of images or a how-to guide. Slideshow posts allow you to create a video without the time required for filming. 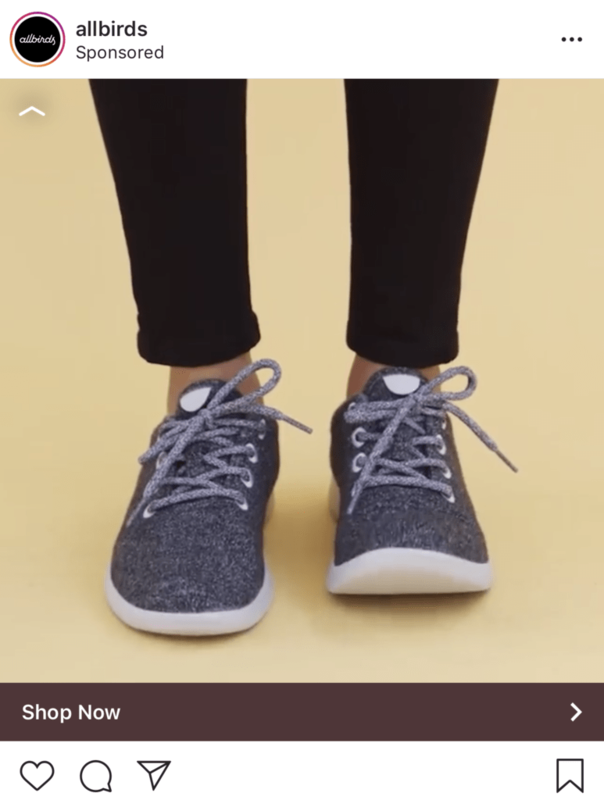 These ads load quickly, making them accessible even to viewers on a slow Internet connection. Instead of choosing a format, you can also create ads based on goals. Facebook offers lead generation ads, offers (or discounts), and post engagement campaigns. Ad goals can be specific to Facebook activity too, such as increasing page likes or event responses. Facebook social media advertising uses an auction system, where businesses bid to receive ad space. The cost depends on your campaign’s daily budget and the amount of competition for your audience. Most ad campaigns are measured by CPC or CPM. CPC or cost per click only charges your account when a visitor clicks on your ad. CPM stands for cost per 1000 impressions, with “M” representing the Roman numeral for 1000. Impressions are the number of times your ad is displayed. An impression doesn’t mean a user has engaged with your content, only that they had the opportunity to see it. According to AdEspresso, CPC (cost per click) on Facebook is around $0.27 while CPM (cost per 1000 impressions) is $7.19 on average. You can also consider alternative ways to buy ads on Facebook. 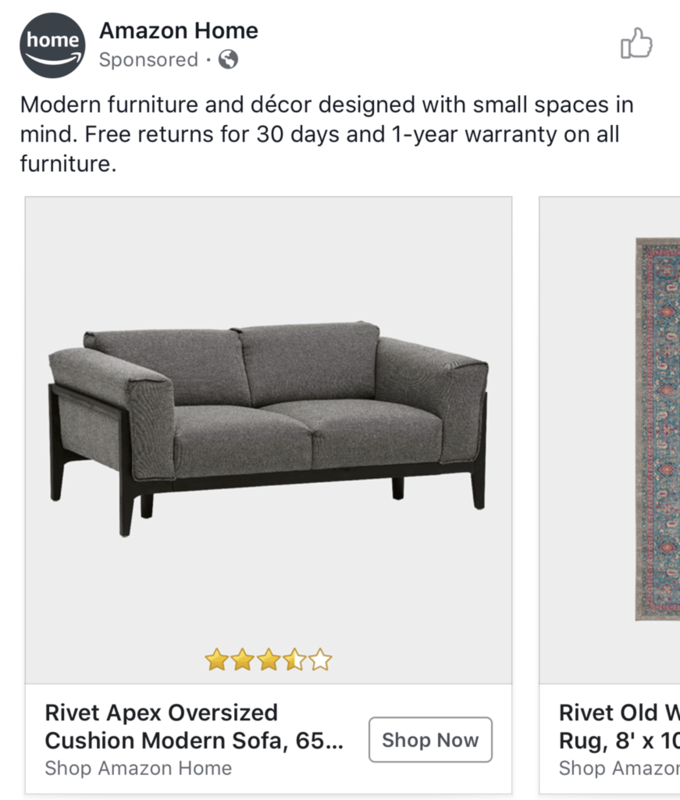 “Reach and frequency” ads are a new feature not yet available to all users. These ads will consider how many people you want to reach and how frequently you want an individual to see your ad. If you’ve ever purchased TV ad space, you might prefer purchasing Facebook ads as Target Rating Points (TRP). Under TRP, you are charged after your ad reaches your target demographic audience. Core options range from geographic location to favorite movies. Custom targeting allows you to upload a contact list or CRM (customer relationship management) data to find your leads on Facebook. Lookalike automatically matches your business with users similar to your existing followers. Facebook advertising offers high value given the site’s massive reach. Facebook remains the social media network and one of the most visited websites in the world, just behind Google and YouTube. With recent changes, brand engagement on Facebook has decreased. Using ads can keep your business in front of a Facebook audience even as the platform continues to change and grow. This highly visual platform is all about images. 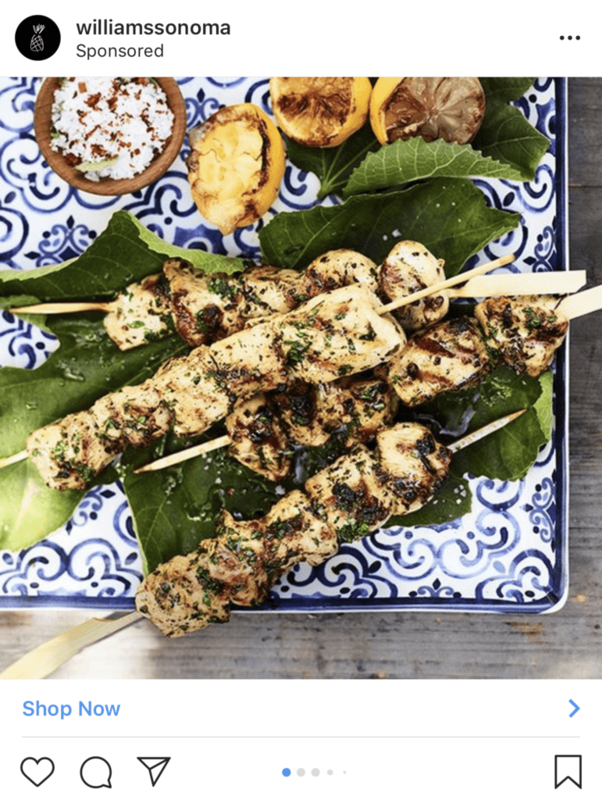 Social media advertising on Instagram should focus on imagery and storytelling. Instagram is owned by Facebook and uses the same ad management system. You can choose between ad formats for Feeds and Stories. These ads appear in a user’s feed and are nearly identical to native posts. Choose from image, video, or carousel formats. Image ads are the easiest to use. Promote an existing post that has already performed well organically and you’ll have the advantage of knowing that the content resonates with your intended audience. Video remains popular and continues to grow on Instagram. With IGTV and a newly revamped Discovery tab, Instagram’s video options continue to expand. Businesses can expect more video ad options in the future. Carousel ads keep visitors engaged with your content longer than a single photo or video. Feel free to get creative and tell a story with your carousel content. According to Instagram, 400 million accounts use Stories daily. This full-screen content mimics Snapchat and only stays online for 24 hours. Instagram’s advertising costs are slightly higher than Facebook and depend on the type of ad and audience targeted. More detailed targeting raises costs. Estimates place the starting rates for an Instagram ad around $5 to $6.70 CPM. AdEspresso finds that the average CPC for an Instagram feed ad in 2017 was $1.15, while Facebook newsfeed ads were $0.50. 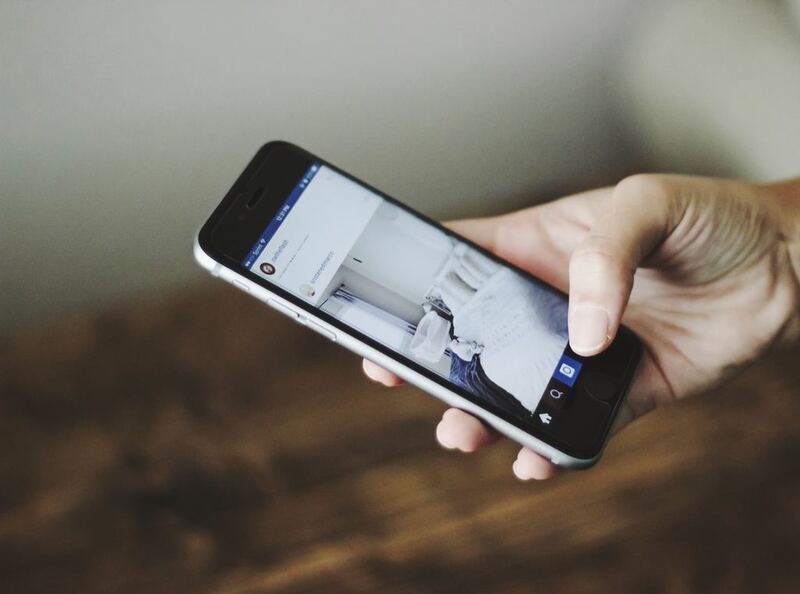 Although Instagram advertising is pricier than most platforms, they produce results. 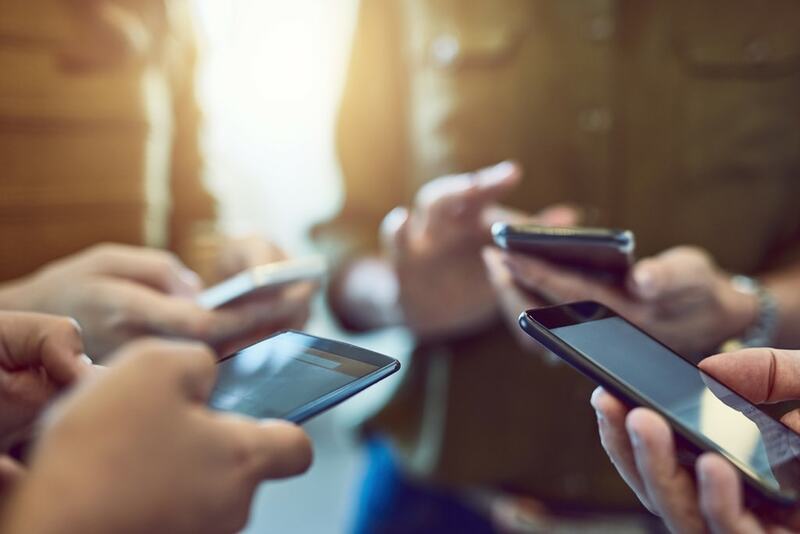 Users are more willing to engage with brands on Instagram than other forms of social media, with 80 percent of users following at least one brand. Ads have 2.5 times the click-through rate as other platforms. If your audience is on Twitter, ads are an effective way to both reach new users and meet specific goals. Website clicks, new followers, and app installs function like CPC ads. Your account is only charged when a user clicks to your website, hits the follow button on your page, or installs your app. Ads for reach are measured by CPM. Engagement ads include likes, replies, and retweets of your content. Less traditional formats include promoted videos, in-stream video ads, branded emojis, and promoted Moments or a slideshow of related tweets. Like Facebook, Twitter uses an auction system where you bid against other advertisers competing for the same audience. You can choose bids manually or set a budget for automatic bidding. Twitter won’t charge you until a user completes a billable action. Billable actions are based on your goal. If your goal is video views, you won’t be charged until someone watches your video. If your goal is website clicks, a click is your billable action. There is no minimum cost to advertise on Twitter, but the platform recommends starting at $30 a day to see results. Tailored or custom audiences let you create lists based on website visitors or CRM data, saving you the trial and error it takes to find your audience with social media advertising. 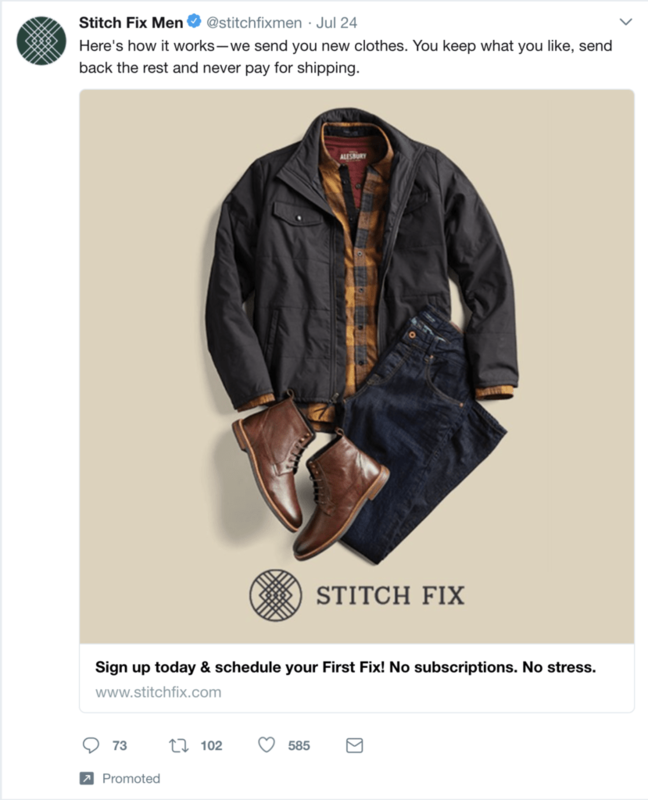 With a strong focus on outcomes, Twitter ads offer predictable results and allow you to customize your campaign for specific needs. 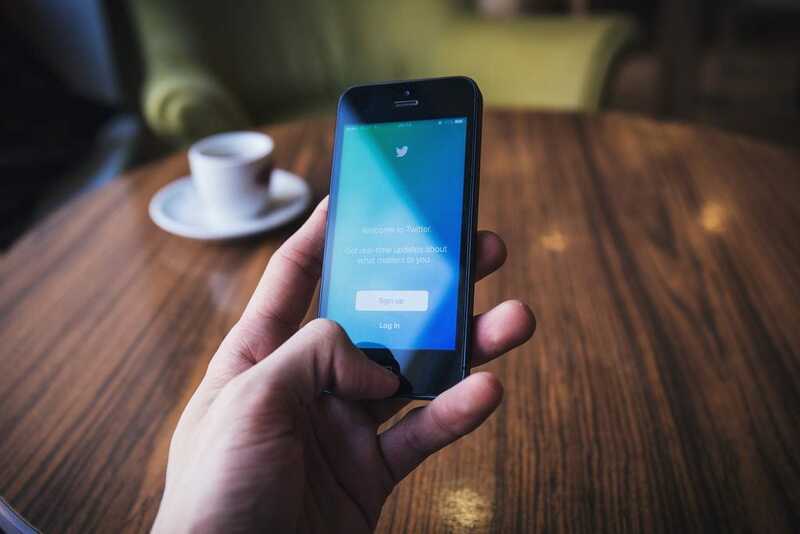 Twitter may not have the reach of Facebook or Instagram, but advertising to small, focused audiences can be an effective strategy. LinkedIn is the must-have platform for B2B businesses. Part-job board, part-resume, and part-virtual networking platform, LinkedIn currently has 562 million users spanning over 200 countries. LinkedIn advertising options include sponsored content, sponsored InMail, and text ads. These three options are entirely self-managed through the Campaign Manager interface. A fourth option, dynamic ads, is available for managed accounts and involves working with a dedicated LinkedIn team to optimize your ads. These ads show up in user newsfeeds. They are automatically mobile responsive, so users can view your ads on desktop, mobile devices, or the LinkedIn app. InMail allows you to connect with users one-on-one through LinkedIn’s built-in messenger. This function lets you reach out to potential clients with a personalized approach. Text ads are small, non-intrusive blocks placed in the right sidebar of a page. Headlines are limited to 25 characters and descriptions to 75 characters. Only users accessing the site on desktop see text ads. LinkedIn costs vary based on your budget. You can bid by CPC or CPM and have three budget options: total budget, daily budget, and individual bid limits. LinkedIn focuses on meeting business needs efficiently, so targeting includes industry, company size, role or job title, and location. The site also offers three options for retargeting existing audiences. Find your website visitors on LinkedIn and segment based on the pages they’ve visited. First, you’ll need to add the LinkedIn Insight tag to your website. LinkedIn’s Campaign Manager will keep track of visitors, who you can divide into segments. Each segment must have at least 300 members to start advertising. Directly upload your contacts list to reach known leads and customers. LinkedIn recommends creating a list of at least 10,000 email contacts before starting an ad campaign. Targeting by account lets you reach users from specific companies. Upload a list of company names and websites and LinkedIn will find matches within 48 hours. LinkedIn grants access to decision makers with higher spending power than the average online audience. According to LinkedIn, four out of five users make or influence business decisions at their company. These users also have twice the buying power of general web users. Snapchat is the youngest social media platform on this list. Despite rising competition, Snapchat retains a consistent user base. A key benefit of using Snapchat is its targeted audience. If your business needs to reach younger millennials (18 to 24) or Gen Z (13 to 18), Snapchat is a unique place to do so. While the base audience may not be as large as other social media platforms, its active monthly user base of over 300 million is still substantial. Snapchat offers three main options but continues to expand. Snap ads, filters, and lenses are the most common and well-known Snapchat ads. Snap ads function like user stories. They’re full-screen video ads that play for up to 10 seconds and include audio. You can achieve some of the highest click and engagement rates with snap ads. Sponsored filters are designs and frames that users can add to their own images. Snapchat filters are not the same as photo filters, which change how the subject of the photo appears. Filters can include your brand imagery but should also provide a fun element. Snapchat recommends designing a filter that takes up less than 25 percent of a screen. 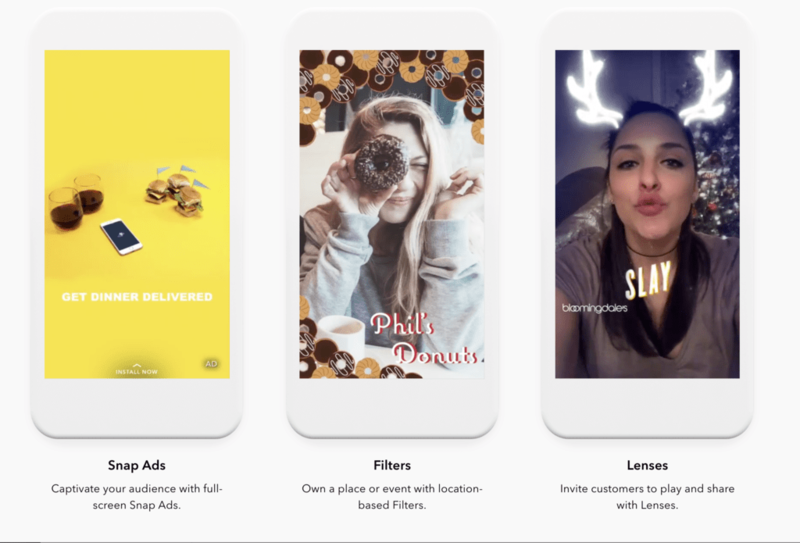 A subset of sponsored filters are geofilters, which make your filter available to users in a set radius. You can set up a geofilter around your physical store, for one city block, or across the entire nation. Small-scale, limited-time ads are called on-demand geofilters. National geofilters have a significant reach but are only cost-effective for large-scale brands. Snapchat lenses are one of the app’s most popular features. Using lenses, you can add effects to your selfie like cat ears, giant alien eyes, or even turn your entire head into a basketball. Sponsored lenses encourage engagement in a light-hearted way. The cost of a Snapchat ad campaign varies by campaign type, but many options start high. Simple story ads run at a minimum of $3000 per month, while filters and lenses can reach six figures. If your target area is small, a sponsored geofilter can be an affordable option. Snapchat charges $5 an hour for 20,000 square feet. But watch out for special events in your area. Running geofilters for or nearby a film festival or popular concert can hike advertising rates up to $20,000. Besides the typical demographic targeting features, Snapchat categories user behavior into four broad categories: Lifestyles, Shoppers, Viewers, and Visitors. The Lifestyle category includes options like travel enthusiasts and gamers. “Shoppers” range from restaurant goers to pet owners. “Viewers” addresses media consumption, breaking down TV and movie viewers by genre, time, and network. Finally, “Visitors” covers users who visit entertainment venues, banks, or auto dealers. The nature of Snapchat requires users to engage as they use the app. This engagement applies to not only native content but advertisements. One company testing Snapchat ads received a 10 percent increase in conversion rates and a 15 percent increase in ROI (return on investment) compared to Facebook ads. The obvious conclusion? Snapchat ads work and can be highly effective for reaching young audiences. If you’re new to social media advertising, Facebook is a great place to start. A wide audience, extensive audience targeting options, and an easily scalable budget makes Facebook a great starter platform. For Facebook ads, start here. If you are an experienced social media marketer, consider expanding your strategy with special features on Twitter and LinkedIn. 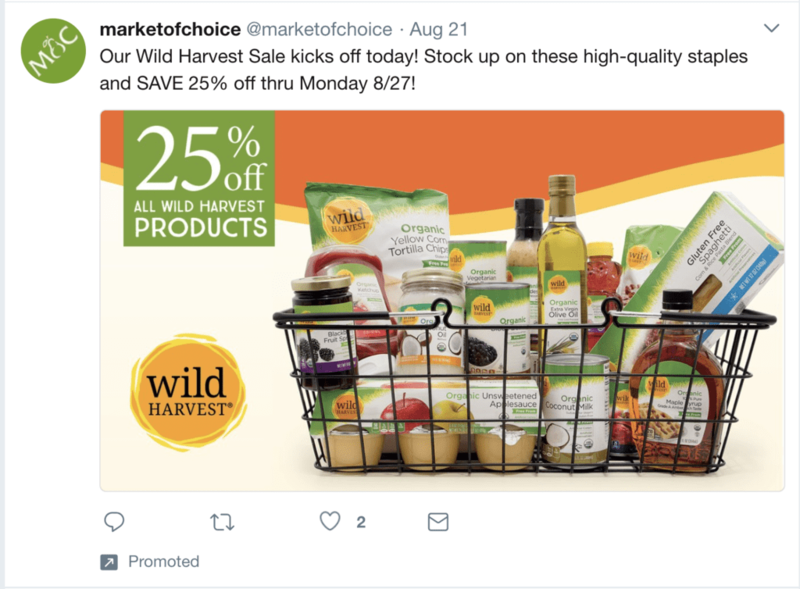 Twitter’s Promoted Trends make it easy to execute hashtag campaigns, while LinkedIn’s InMail ads allow you to take personalized social media advertising to the next level. Begin tweeting with Twitter ads or visit LinkedIn for a business audience. Finally, if your business relies on visuals and a younger audience, Instagram and Snapchat are strong contenders. Social media advertising on these platforms can be pricey, but they pay off with especially high rates of engagement. Instagrammers, head this way. Or keep up with the kids on Snapchat. Start a new campaign, step up your current strategies, or get experimental. Social media advertising has become one of the best ways to reach your audience. With options for every business, getting started is easier than ever.